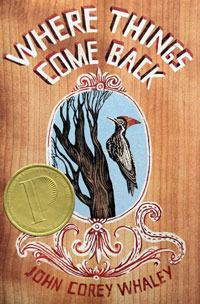 Sign into Goodreads to see if any of your friends have read Where Things Come Back. I've read this about five times in the past hour and I love it every time. Thanks for your thoughts :) Hopefully more people will pick this one up! The author actually came to my school last year. Pretty cool guy. Thanks for the recommendation, Maggie. Finished it yesterday. So glad I took your advice. I thought the concept interesting ever since I watched a documentary on the real-life spotting (still up for debate) of the ivory-billed woodpecker, long extinct, and how it brought woodpecker madness and much needed business to a struggling southern town a few years ago. Definitely adding the novel to my TBR pile! I love WTCB. It was one of my favs of last year. I just wish that I could get more kids to read it. I adore Corey Whaley. He is delightful.